Attn. Guild Program Chairs: If you would like to have Karen visit your area, please click here and complete the online contact form. To view Karen's books, patterns and notions, check out her on-line catalog . What are Karen's classes like? Click here to read comments from students. 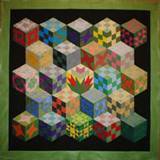 Explore the world of optical illusions with Karen as she shows you some of the wonderful quilts that she has created. A beautiful and inspiring trunk show. This the chip going in or does it go out? 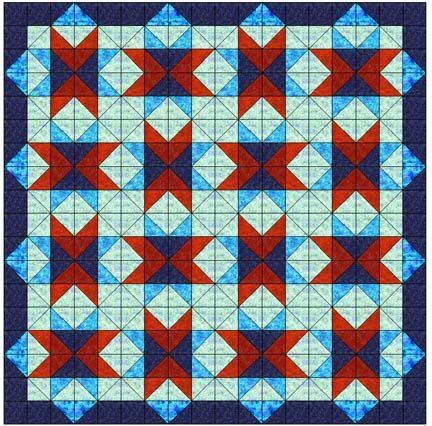 An fun quilt of illusion, so simple to make, once you know how. A throw that can grow to any size you wish! Let Karen show you how easy it is to create a intriguing quilt of illusion. Do these colors go together? This is one of the hardest questions that quilters ask themselves. This class will help quilters pick colors and fabrics with confidence. 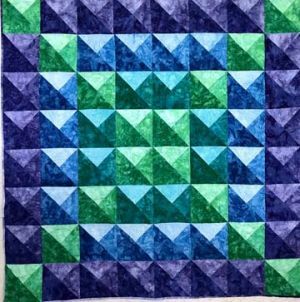 In the first part of the class, we learn how to work with different prints that will lend visual texture to quilts. We will work with large, medium and small prints and learn how to combine them successfully. Later, we will learn how to combine colors together and learn how to add more color to your quilts. It's old, but its brand new! Hexies and English Paper Piecing are all the rage! Why, because this technique is easy, fast, accurate and best of all, portable, perfect for sitting and stitching, no matter where you are. Let Karen show you this popular technique while creating an amazing 3-D quilt. Frankly, Karen avoided this kind of piecing for years...until she tried it. Now she's hooked and it is her "go-to" take along project. Don't worry if you've never tried it before, we will start at the beginning and learn all the tricks and tips need. CAUTION: You may become addicted! This truly is a magical way to put your fabric stash to work by making a wonderful scrap quilt. ANY fabrics will work using this template-free method. Learn to feel comfortable putting many fabrics together, to distinguish "value" and be able to make many different scrap wallhangings or quilts. Based on Karen's book Combing Through Your Scraps. You may work on a quilt in class using shared fabrics from your classmates. This is a great place to use "ugly" fabric, to use up older fabrics, to use favorite fabrics, all while making a beautiful quilt. If you wish, bring extra fabric to class to share with your classmates. Karen has developed a truly magical way to create pieced Celtic quilt. This is one of Karen’s favorite classes because it is so easy to create amazing Celtic Quilts. Let Karen share her secrets, so you can quickly and easily create unlimited pieced Celtic quilts. Based on Karen's book, Celtic Pieced Illusions. This isn't your traditional Christmas wallhanging! 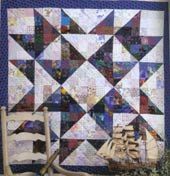 This special wallhanging was featured on the cover of the Holiday Issue of Lady's Circle Patchwork magazine in the fall of 1996 and in the December 1998 issue of McCall's Quilting. You can go home with a finished top, ready for quilting and embellishment. How did you do that? This is what your friends will ask after you take this class! 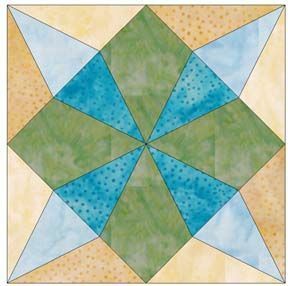 You will turn the traditional quilt block, Crystal Star into a wallhanging that looks 3-D. You will also learn how to use color to enhance the 3-D effect. It's fun and fast! How did you do that?! This is what your friends will ask after you take this class. 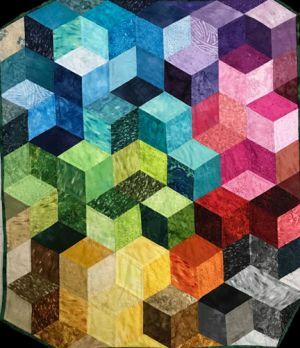 Create this truly stunning 3-D quilt with Karen’s special rotary cutting techniques, along with tricks and tips. A perfect class for a quilter with sewing experience. This is a beautiful quilt with the illusion of depth. Don’t let it scare you, the piecing is easy, created from just triangles! 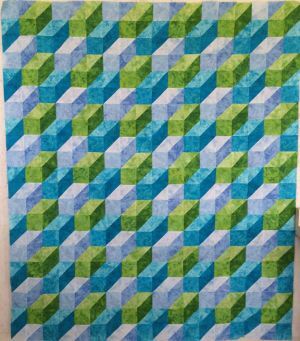 Believe it or not, this stunning quilt is created with just one block, done in different colors. It's old, but its brand new! English Paper Piecing (or EPP) are all the rage! Why? - because this technique is easy, fast, accurate and best of all, portable, perfect for sitting and stitching, no matter where you are. 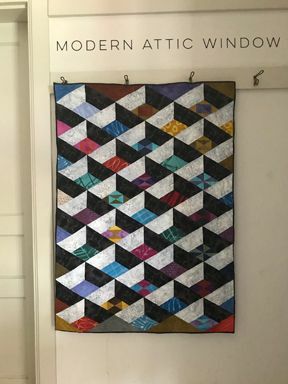 Kare will share her newest EPP Quilt of Illusion – Modern Attic Window pattern in this class. Learn the tricks and trips for creating this amazing 3-D quilt. Caution - you may become addicted! 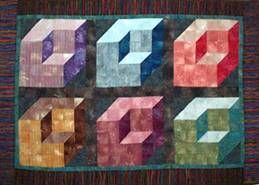 Learn all the tricks and tips to creating 3-D patchwork blocks. 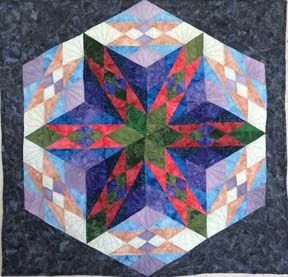 You will also learn how to use color to enhance the 3-D effect and how to use different settings to create amazing quilts of illusion! Visual depth has fascinated artists for centuries, Karen has developed a quick and easy rotary technique that allows you to make quilts with a 3-D look. 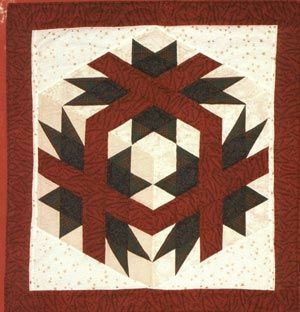 In the class, you will learn how to create quilts shown in Gallery 3. More examples from this class can be seen by clicking here. A beautiful quilt of illusion, so simple to make, once you know how. You can select your 3 favorite colors and create this stunning quilt! A great pattern, that is a throw that can grow to any size you wish! 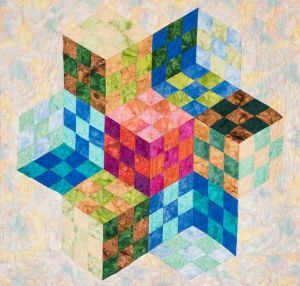 Let Karen show you how easy it is to create an intriguing quilt of illusion. The following classes may be booked as a 2 day workshop. A 2-day workshop allows the students to work closely with Karen as they explore more design and fabric options. In many cases, the students will finish piecing their projects by the end of the second day.